Hello friends, Samm Bennett here. 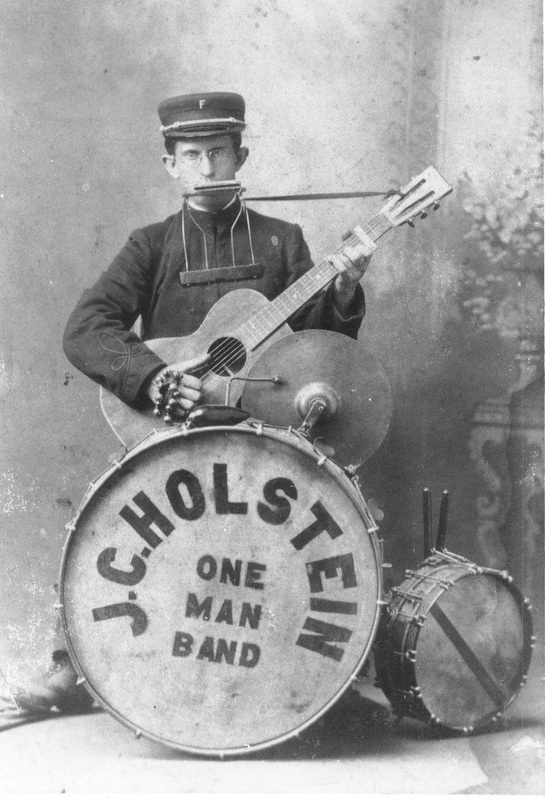 This is a collection of old photographs of one man bands I've collected from here and there around the web. I have a special place in my heart for these guys, partly perhaps because a lot of my solo music work over the years has skirted the edges of (or sometimes fully embraced) the one man band idea.Hope you enjoy this gallery! Oh, and be sure to drop by my page featuring my collection of *ahem* original one man band jokes. Fermín Lima, luthier. Buenos Aires 1936. 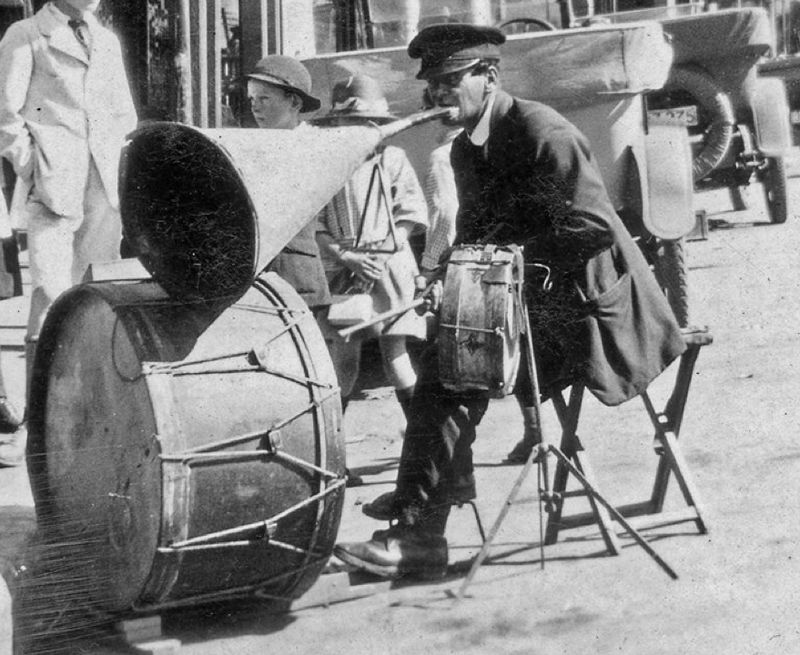 No big, booming bass drum for this highly refined gent! Just a tasteful, delicate triangle and a hotel front desk bell. Do I want this bass drum? Why, yes, yes I do. 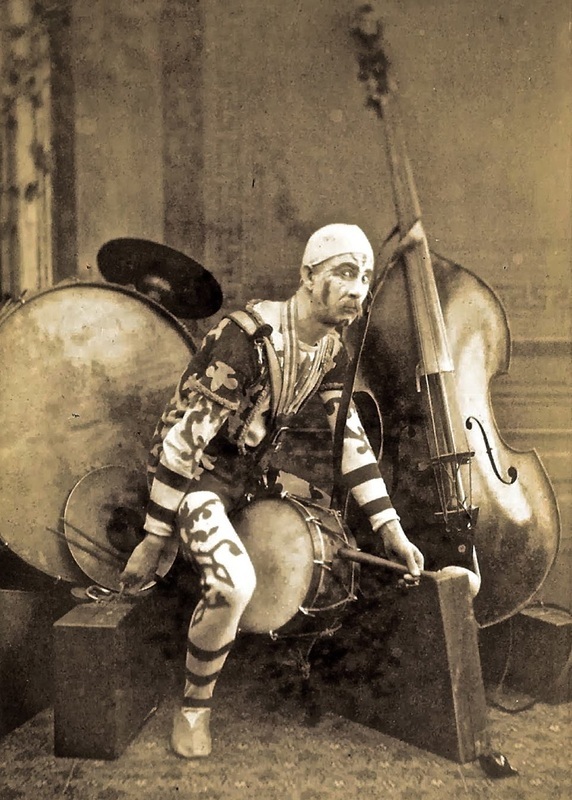 Not sure if this is an actual one man band or rather just some… clown. But I like the picture, so, it's here. 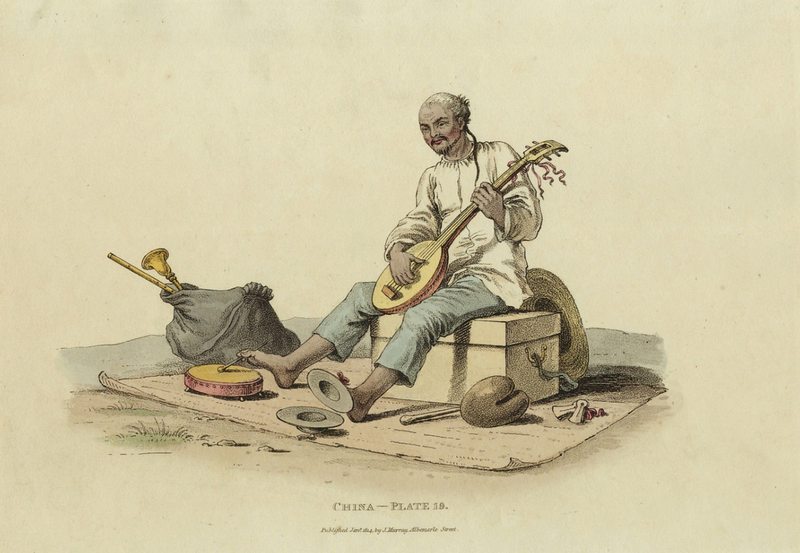 With the exception of this lithograph from 1817, all of the images in this collection are photographs from America or Europe, but the idea of the one man band wasn't limited to those places. The fellow above was accompanying his stringed instrument with percussion. 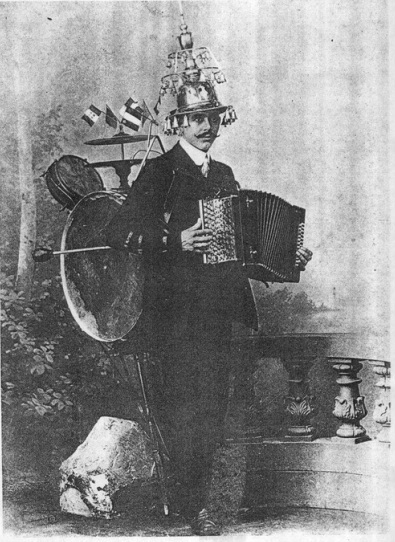 Found this photo and several others here in this gallery at the Facebook group: One Man Band Club. Check 'em out! 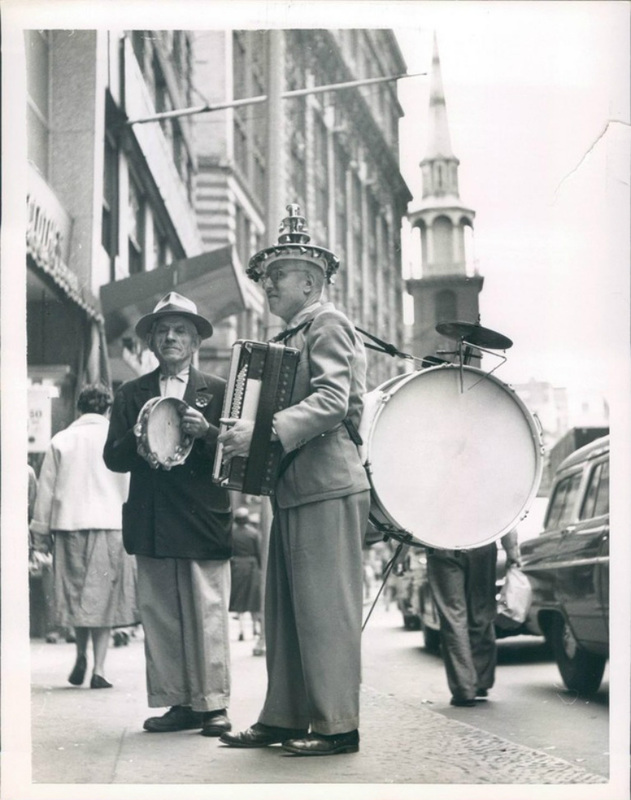 Above, right and below: One man band Panhandle Pete. 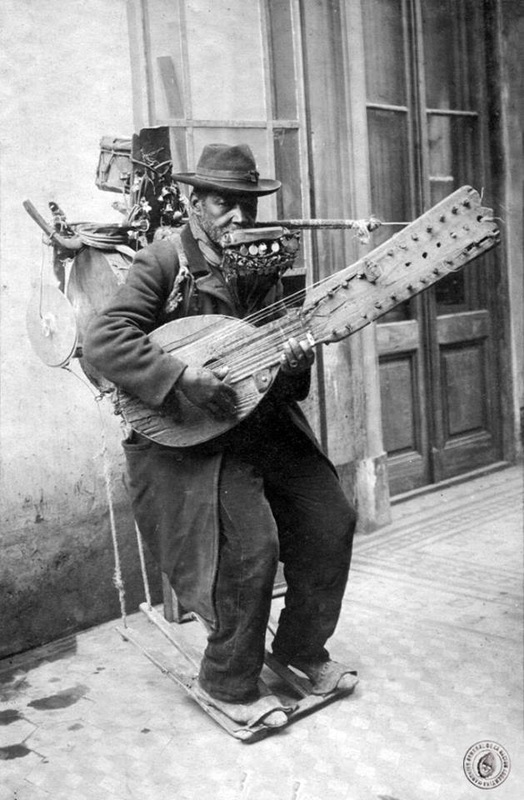 From Mountain Grown Music, here's some info on the man: "Panhandle Pete blew, plucked, picked, elbowed and kicked his way into Haywood County (North Carolina) musical history as a one-man band carrying around his 104-pound instruments that were strapped onto his body. 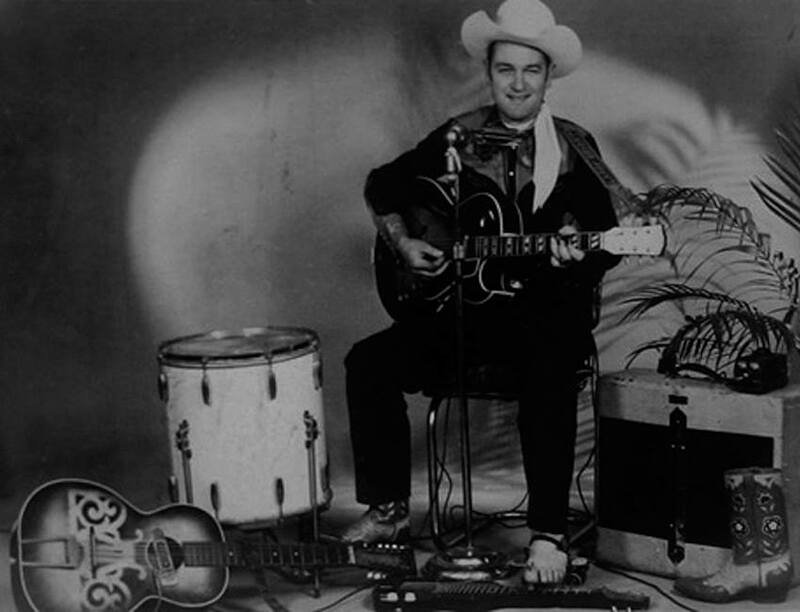 Born in 1913, James Howard Nash adopted the stage name Panhandle Pete as his one man band persona gained a reputation. 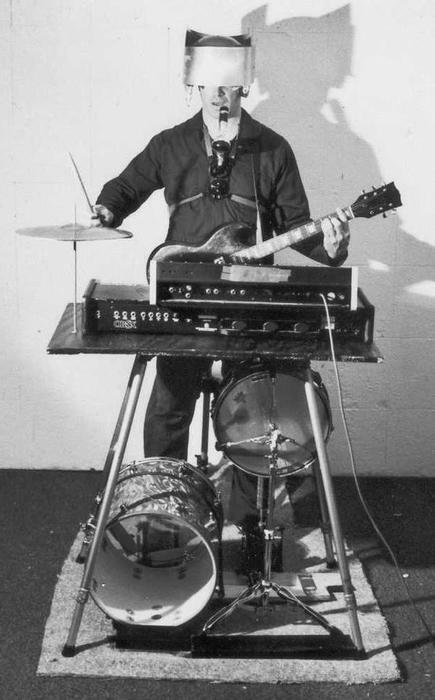 He combined 14 instruments and gadgets on a backpack-like system that included cow bells, cymbals, a tambourine, a banjo, a kazoo, harmonicas, a garden hose, a bicycle horn, a car horn, an exhaust whistle, a train whistle and a bass drum. 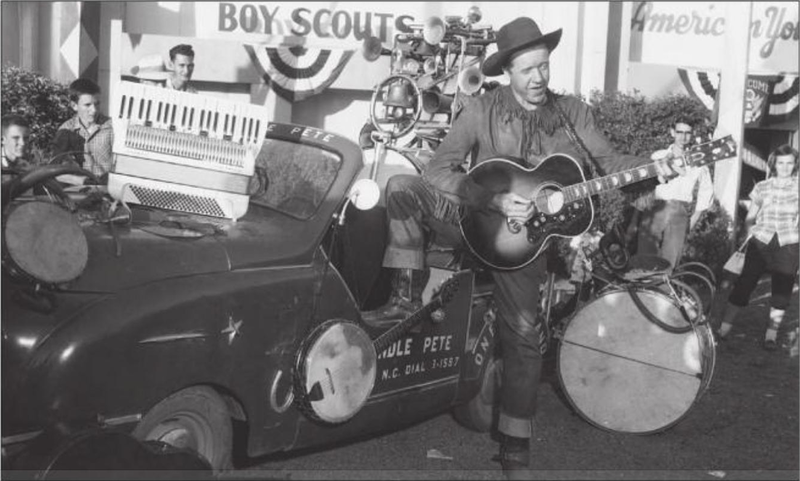 - A self-proclaimed “Poor Man’s Philharmonic,” Pete played at area festivals and made appearances on TV programs such as “The Ed Sullivan Show.” Part musician, part comedian, he was an unforgettable entertainer who performed in 33 states and recorded several albums of old-fashioned ballads for the U.S. Library of Congress. 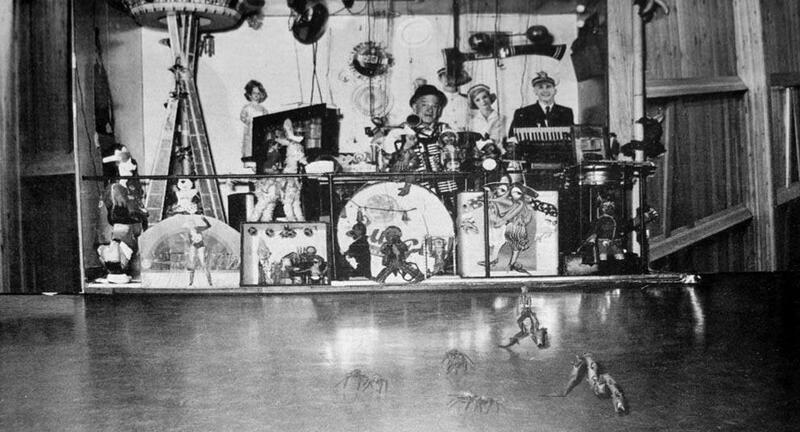 By 1961, Pete took a job as the director of the Ghost Town In The Sky amusement park in Maggie Valley, N.C., and over the next decade performed 3 or 4 shows a day during its six month season. 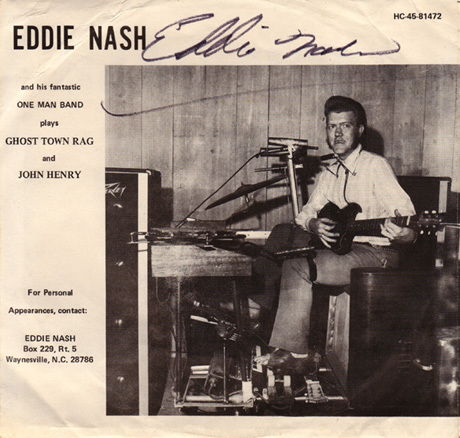 James Howard Nash died in 1972." 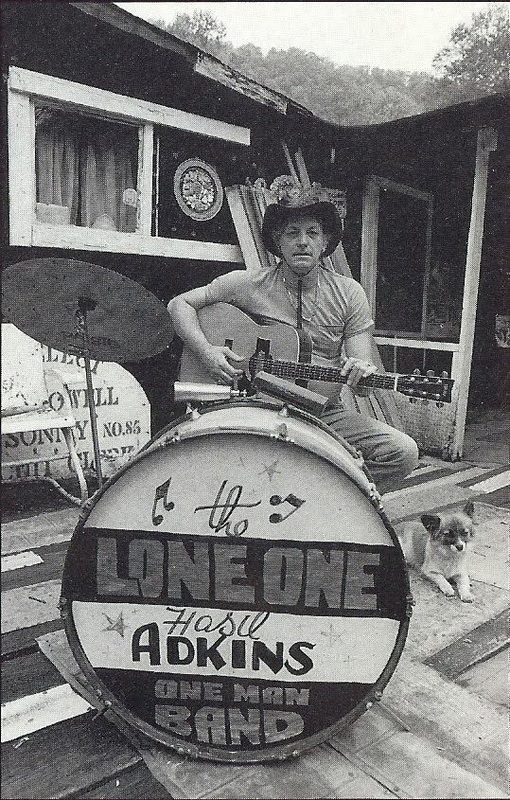 Promo shot of Jesse “Lone Cat” Fuller. 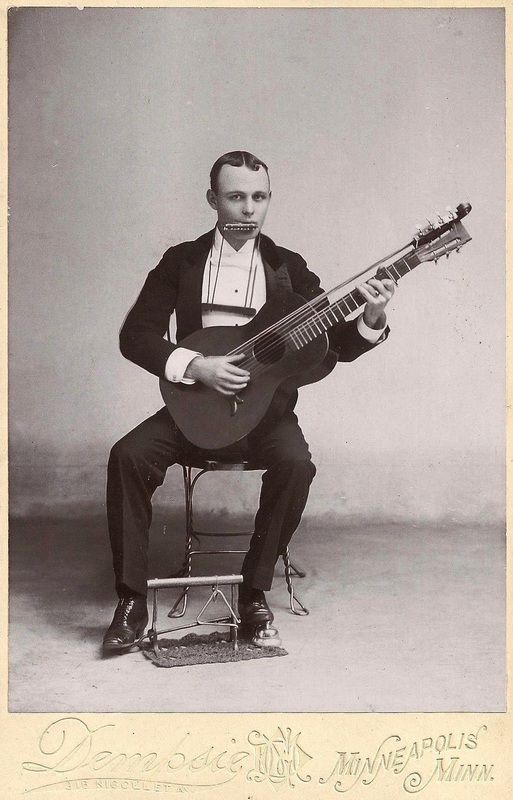 Best known for his song “San Francisco Bay Blues,” Fuller appeared in silent films like The Thief of Baghdad, hoboed cross-country, worked in the California shipyards, and, of course, played music. 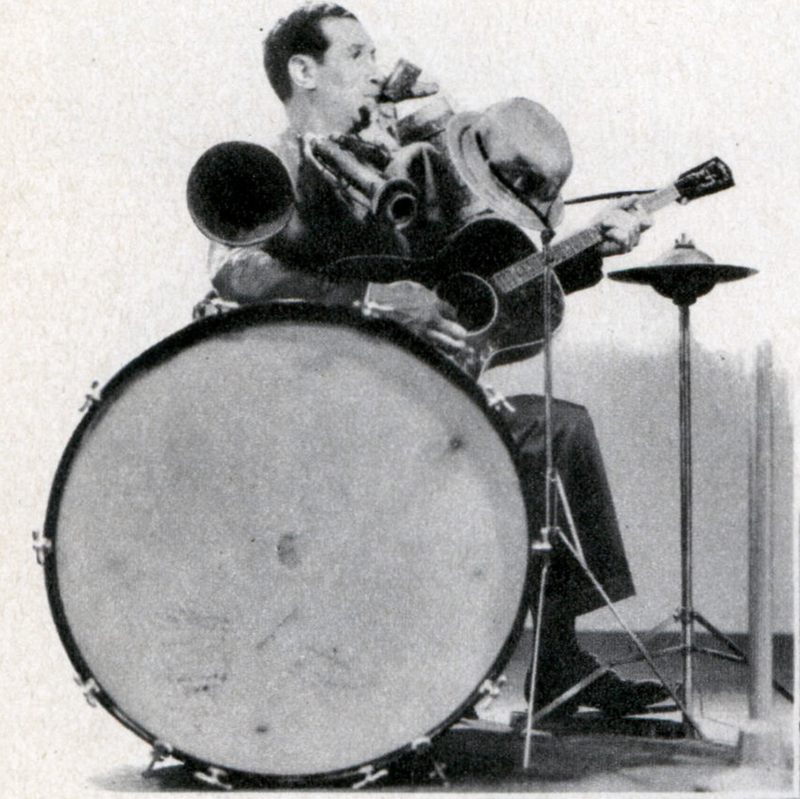 Shown here is his self-built own bass accompaniment, the “fotdella”, as well as a hi-hat device that looks like it might've been self-built as well. Also note his harmonica on a neck rack, and 12-string guitar. Fuller died in 1976 in Oakland, California. 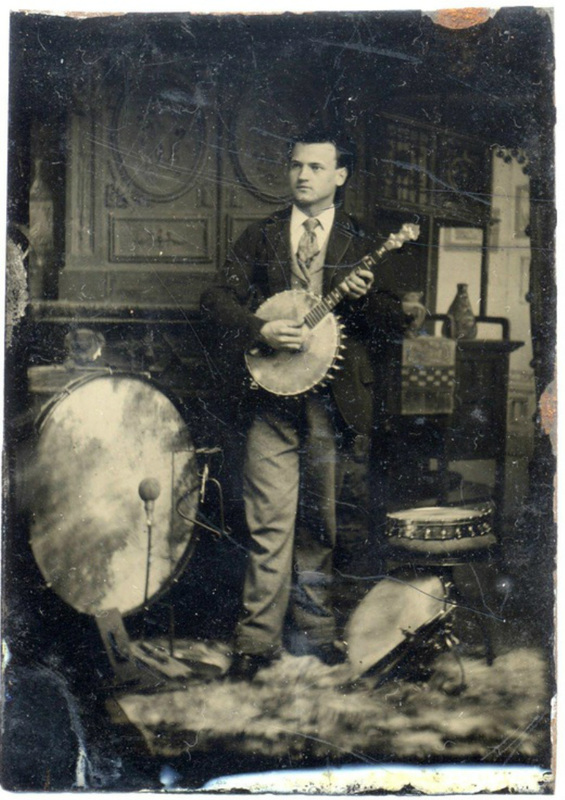 The image is from the John Edwards Memorial Foundation Collection, and I found it in a post from the wonderful Southern Folklife Collection blog Field Trip South. Hey! 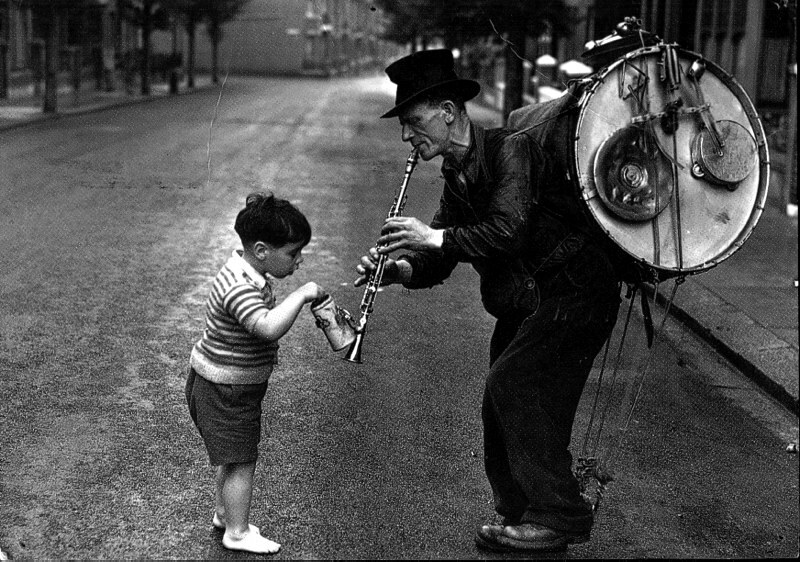 A tambourine player? That's cheating! Fastest toes in the business! The fellow in the four pictures above was keenly interested in promoting his unique contraption. He certainly documented it thoroughly. 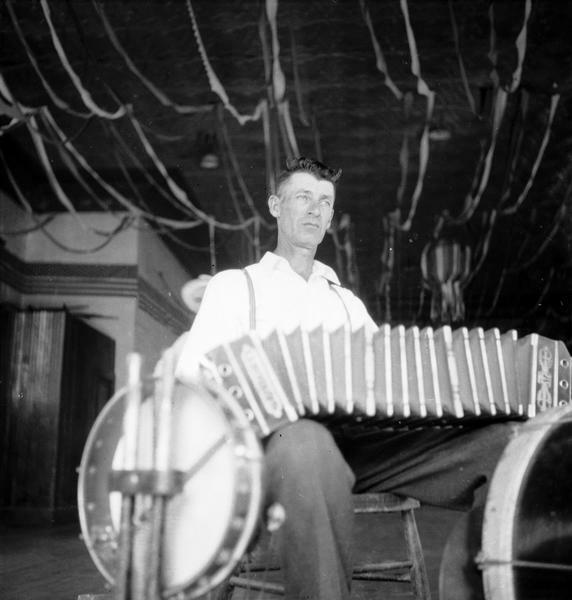 The two pictures above, taken in 1946, show one man band Joe Yanksy of Wisconsin. 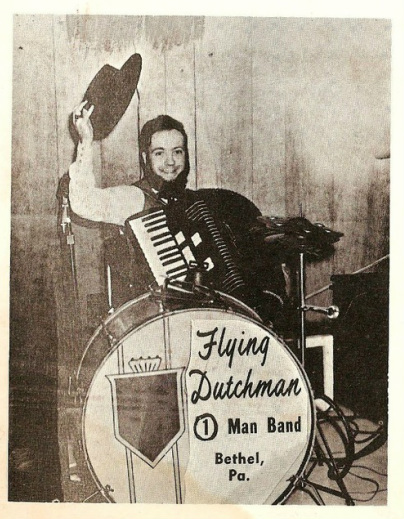 He plays an accordion and two foot operated drums. One of the drums is a standard bass drum, but the one he's operating with his left foot is some hind of frame drum he's obviously rigged up himself. 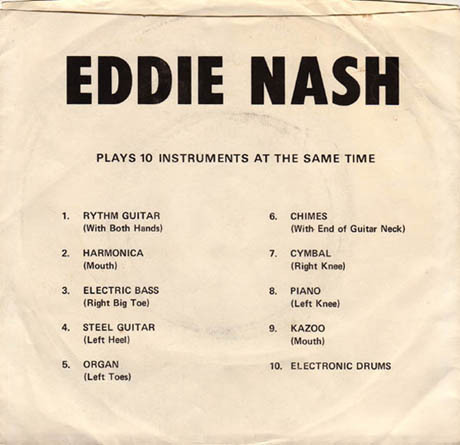 This is particularly interesting for me, as I put together a VERY similar type of drum operated with a foot pedal also, before I ever saw his photo. Here it is. 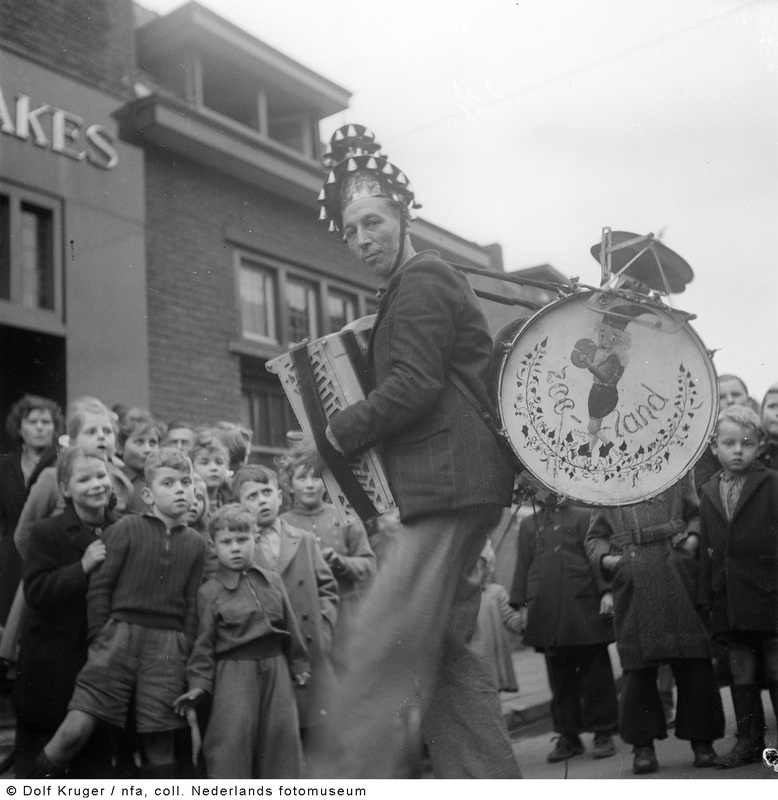 Above and right: Dutch one man band Wim Sonneveld. These photos from the 1950s. 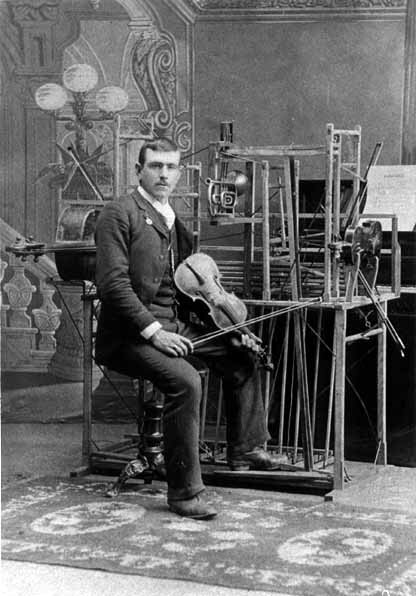 Instrument maker and one man band Joe Barrick. You can read about Joe here. Well, I certainly wouldn't wanna miss the one and only Larry! This guy's got a foot operated triangle in addition to the bass drum. I have no info on this photo. If you know anything about it, please drop a line via the Contact Form. 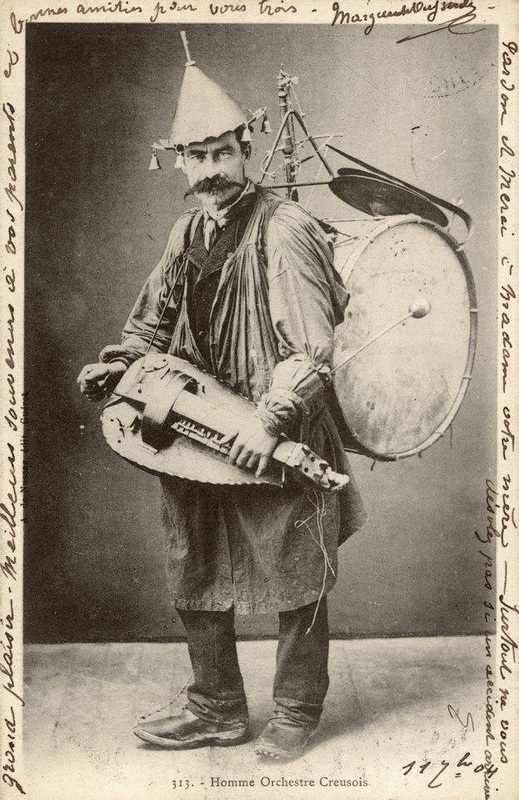 One man band with hurdy gurdy. 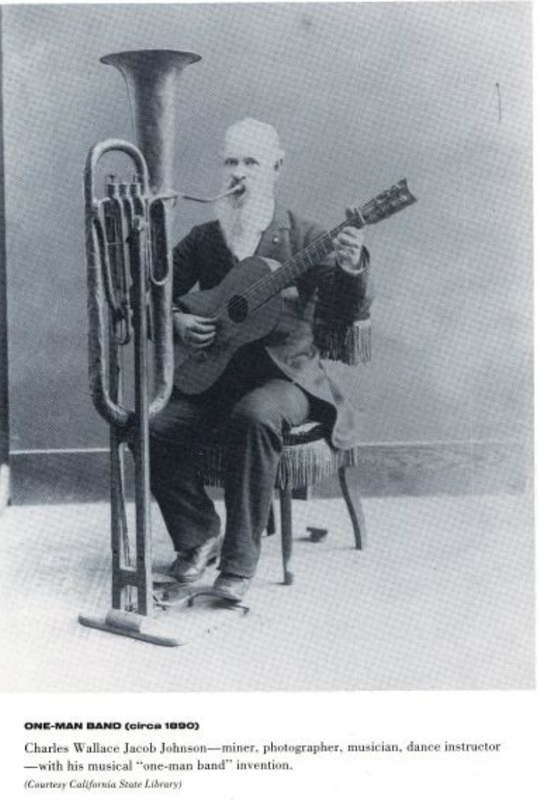 Unusual Musical Instruments. Stay tuned! 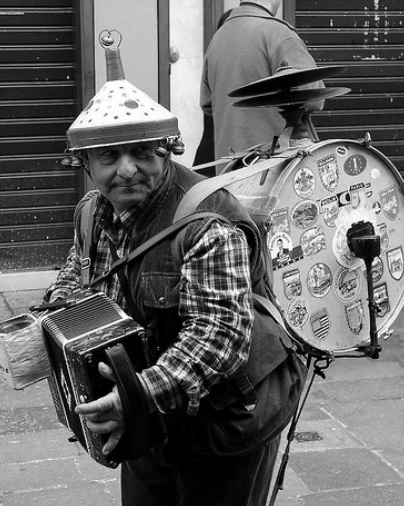 Another hurry gurdy a one man band. Or, the same fellow? Remember this fellow from earlier in the collection, up above? 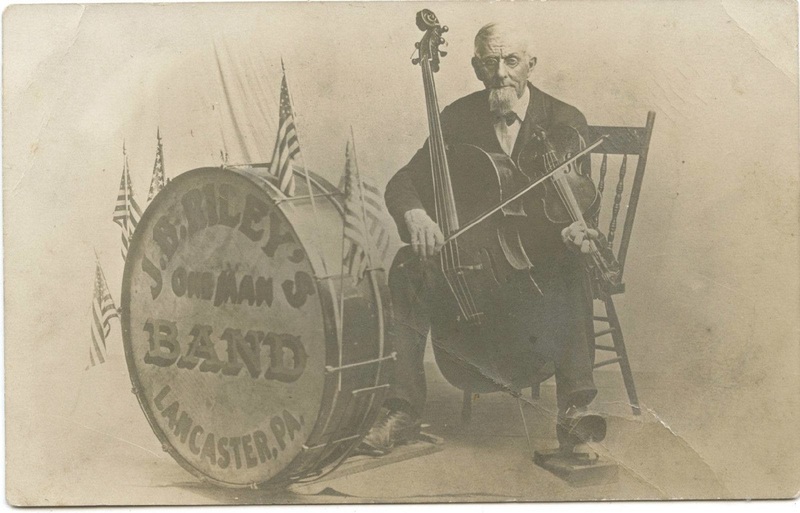 Well, here he's gotten a bit older, changed his bass drum pedal a wee bit, and started playing his fiddle in a mose usual manner, as opposed to on his knee. 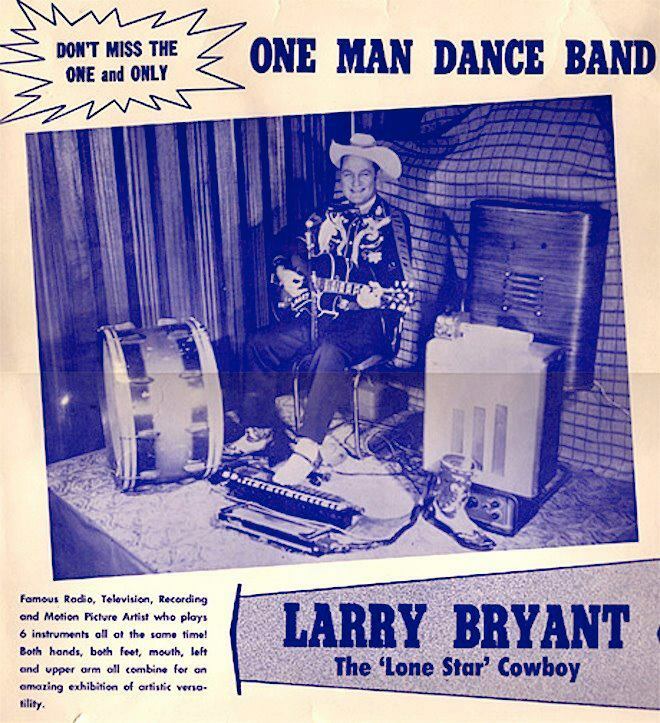 Directly above is an album cover from a release by Abner Jay. 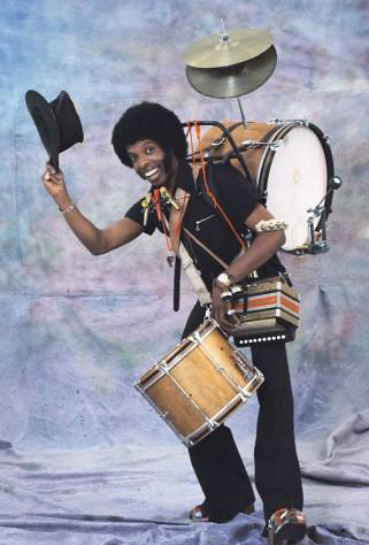 Musical genius Sly Stone wasn't, of course, an actual one man band, but I think this photo deserves inclusion in this gallery nonetheless! To the right is an advertisement for a Sly and the Family Stone album that uses a photo from the same session. 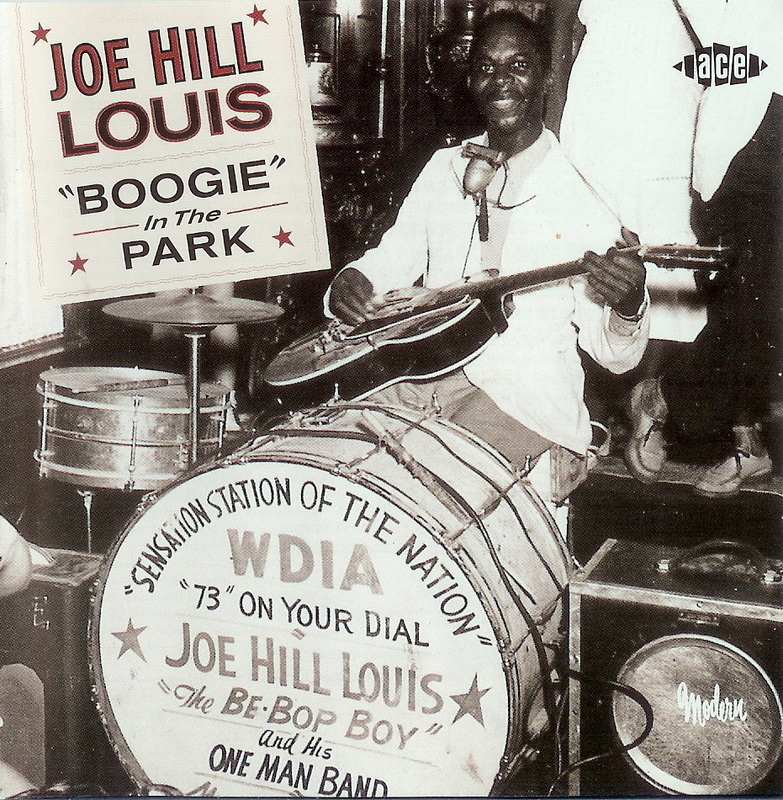 Right and below: One man band Joe Hill Louis, the "Be-Bop Boy" was a drummer, harmonica player, guitarist and singer. the legendary Sam Phillips and the Sun label of Memphis, Tennessee, sometimes as a one man band, and sometimes with other musicians. I'm a fan, and have collected some of my favorite Joe Hill Louis songs (on YouTube videos) and related links on a Joe Hill Louis page here at the site. 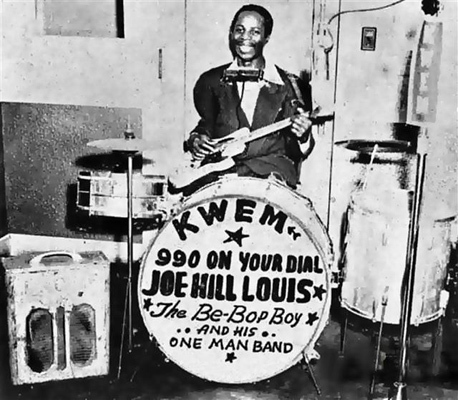 You'll note that on this Joe Hill Louis photo (which was the jacket of a compilation CD release) Joe Hill's drum head displays "WDIA 73 ON YOUR DIAL", whereas the photo of Joe Hill up above this one has him promoting KWEM 990 ON YOUR DIAL. My man had all kindsa sponsors! He had Memphis radio sewn up! Also in the photo above note his harmonica has a Green Bullet mic attached. No Green Bullet mic for this guy's rack harmonica: I guess we can assume he wasn't a bluesman. But he's sure got some cool alarm bells rigged up to his right, and that contraption he's working with his feet is very intriguing. Cool speaker to his left, too. And the homemade ukulele looks interesting. Wish we could hear this guy! I have no information on this intriguing old photo. If you know anything about it, please contact, via the contact form! 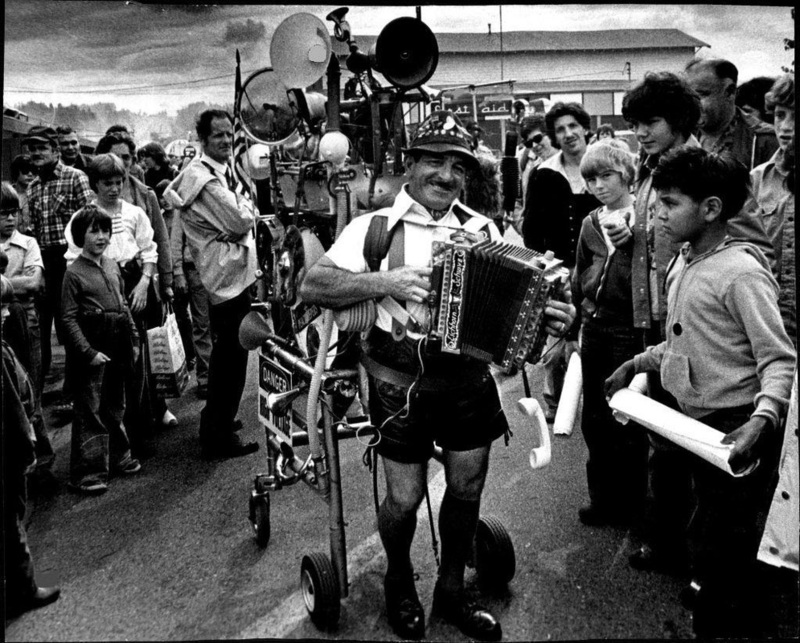 German one man band Werner Hirzel, 1977, with his elaborate contraption-on-wheels. 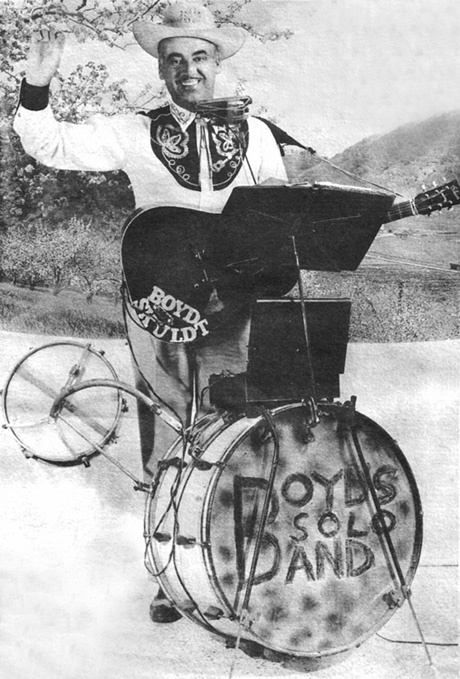 The two pictures above feature a one armed one man band: Mr. W.C. Williams. One with a mustache (a younger man, it appears) and one clean shaven. Wow. And I am absolutely lusting after that very shallow bass drum he's got in the lower picture. 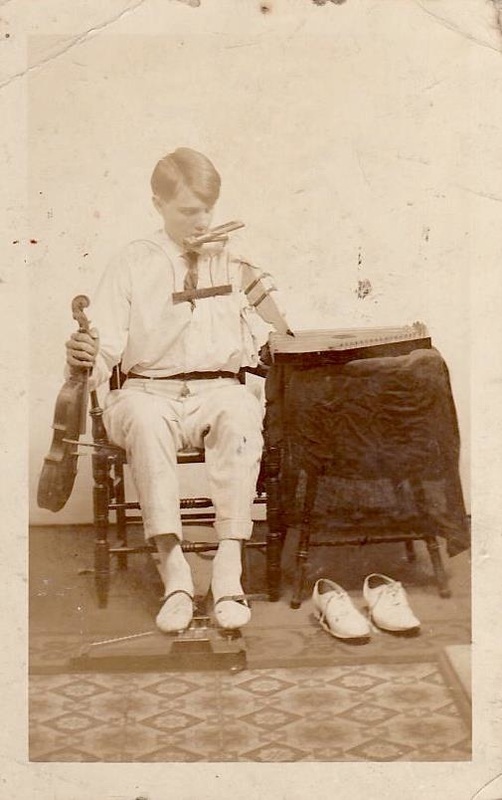 Seems he was pretty ingenious with the foot-controlled percussion: in addition to the usual bass drum, he has a selection of old bells, like the ones you find on old hotel lobby desks. And some big sleigh bells strapped around his ankle. And a foot-operated triangle. Unfortunately the photo quality is too poor to convey exactly what sort of device he'd put together to play that snare drum in the bottom photo. But note also the long thin rod he has coming out of the top of that bass drum beater: it's for striking that cymbal he has mounted on the bass drum. 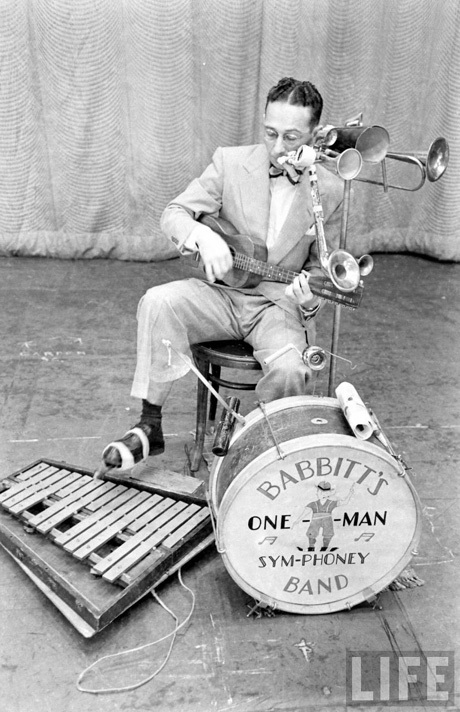 Now, this is a unique (self made) contraption, but the idea for hitting a bass drum-mounted cymbal at the same time the bass drum is struck with the foot pedal was not an original idea. It was a standard feature on the old drum kits, and you can learn more about that at my Vintage Drum Kits page.